RimhillEx is a free Windows program that you can make use of to reduce the noise optical drives connected to the PC make when they read or write data. I have to admit that I'm rarely making use of the DVD drive of my desktop PC. It is mostly used for burning data backups, or media files that I burn for my parents. I do load data from DVDs sometimes though, for instance from data backups when I need to access files again, or on the rare occasion when I'm watching a movie on the computer. Whenever I perform those operations, I'm irritated by the noise that the drive makes when it is reading optical discs. As you may know, I'm noise sensitive and select the hardware of all my computer systems based on noise level more than anything else. Side note: Check out the following guides if you want to find out more about my quest to reduce the noise generation of my Windows PCs: the most annoying PC noise makers, hard drive noise reduction, and create video card profiles to save power and reduce noise. One of the options that you have in regards to optical drives is to reduce the drive's spinning speed. Modern drives read discs faster than older ones and to do so, they spin the disc faster. While that is useful if you need to copy data off the disc, it is generating more noise and may not be beneficial at all if you use the disc for other activities such as watching a movie or less of an issue if speed is not that important. RimhillEx is a free program for the Windows operating system that provides you with the means to reduce the spinning speed of optical drives. Once you have installed the software on your PC, you can access its functionality with a click on the program's system tray icon. 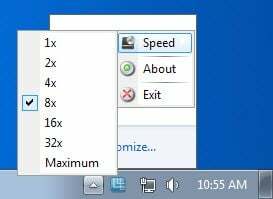 A speed of 8x is selected by default, but you can change that to improve the drive's performance if you select a higher speed or lower the noise generation even more by selecting a lower speed. One thing that you can do if you need to copy data off a disc is to increase the speed of the DVD drive temporarily using the software. This speeds up the data transfer and once that is done, you can simply lower the speed of the drive again. I have not tested the program on a system with multiple optical drives installed. It appears from the menu that its setting will affect all of them as it appears that you cannot specify a drive separately using the application. If your CD or DVD drive is making a lot of noise when it is spinning up, and if that annoys you, you may want to consider installing RimhillExe to do something about it. The trade-off is a slower data read speed but since you can adjust the read speed manually at any time, should not be much of a problem either. Nero DriveSpeed used to be the often used and recommended software for what is described in this article. I do not know whether it still is. The software was available for download at http://www.cdspeed2000.com/ or and included in the Nero Burning ROM Nero 5.5 packages. The software ran without setup installer. The latest version (3.06) was distributed via the Nero Burning ROM installation packages. Nero DriveSpped 3 series software was from before NT6 series Windows operating systems. I am not sure if is compatible with Windows Vista/7/Server 2008/8, but the software was supposed to have been compatible with Windows Vista (even though the last version was released the year before the Windows Vista release). “Nero Burning ROM Nero 5.5 packages” should have been “Nero Burning ROM Nero 6.6 packages”. Or you can just physically remove your cd/dvd drive and replace it with something more useful like an extra SSD drive. If you ever need the drive, buy an external one – they are cheep as dirt! My ears say ‘Thanks for the tip’.